Flank steak used to be considered a poor man’s cut of beef. In the last decade it has risen to be a star among steaks, along with hanger and skirt cuts. It is extremely flavorful and lean. Care must be taken with this particular cut of beef. Overcook it and it will be chewy and dry. Not letting it rest after cooking will cause the juices to run out. Slicing it improperly will result in meat that is not edible. We’ll address each of these aspects in the recipe. I paired the flank steak with Japanese sweet potatoes. These are white or creamy fleshed potatoes, similar in texture to a russet potato, but definitely in the sweet potato family. The flesh is firm, vaguely sweet, and takes well to a Foreman Grill. These potatoes caramelize nicely and are quite filling. They are a perfect side to a flank steak that has been well seasoned in a salty, sweet, and sour marinade. Marinating the flank steak for 2 hours or up to 24 hours will help to tenderize it. This cut of beef absorbs flavors very well and can stand up to a hardy marinade. This recipe is for a 1 pound steak. It should feed 4 people. Double the marinade amounts for a 2 pound steak. I cut the steak in half so it would fit on my basic Foreman Grill. Leave it whole if you are using a larger grill or the indoor/outdoor grill. If using the indoor/outdoor grill, modify the recipe to cook the steak 3 to 4 minutes per side, flipping it over at the 3 minute mark. 1. Place all of the marinade ingredients in the plastic bag inside the bowl or baking dish. Add the flank steak to the bag. Seal the bag well, pushing any extra air out. Massage the meat to coat it well. Place the sealed bag back in the dish or bowl just in case it leaks. Place that in the refrigerator for at least 2 hours. 2. Remove the meat from the refrigerator and allow it to come to room temperature for approximately 30 minutes prior to grilling. 3. Preheat your Foreman Grill to high heat for approximately 5 minutes. Discard the marinade from the meat. Place the damp steak on the hot grill and close the lid. Cook for approximately 5 minutes on high for a medium rare steak. For fancier grill marks you can rotate the steak 45 degrees after 3 minutes. 4. Remove the steak to a cutting board and cover with foil. Allow it to rest for 10 minutes. Meanwhile, grill the sweet potatoes. See the recipe that follows this one. 5. Slice the flank steak against the grain, on a diagonal, into 1/4 inch thick pieces. If you slice it in the direction of the muscle grain it will be hard to chew and digest. Here is a short video from CuisineVideoGuy that shows how to slice flank steak. Serve with grilled sweet potatoes and a side salad or slaw. 1. While the grill is still hot, place a ball of wet paper towels in your plastic tongs. Wipe down the grill surface to remove the caramelized bits from the marinated meat, as these will be blackened and bitter. 2. Slice the potato into 1/4 inch think rounds. Coat with EVOO, salt, and pepper. 3. Grill with the top closed for 10 minutes or until soft and showing grill marks. 4. Sprinkle with salt, if needed, and serve with the flank steak. Note: If using a Basic Grill, cook the sweet potato in batches and keep them warm in a very low oven. 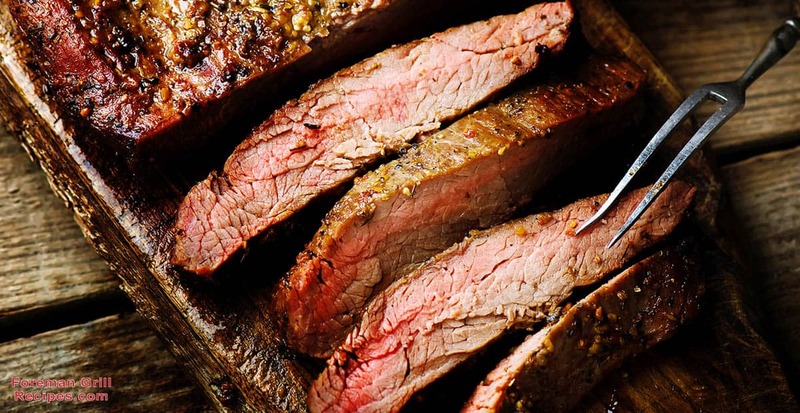 Beef is likely one of the best sources of protein and vitamin B-12. Protein is essential for bone structure, muscle building, cartilage production, and maintenance of skin and nails. Vitamin B-12 is necessary for red blood cell formation. Without adequate B-12 you can succumb to anemia, making you very tired and lethargic. are a rich source of vitamins A, C, E and B-6. They also contain potassium, calcium, manganese, copper, iron, and magnesium. If you are concerned about nutrition and calories, feel free to enjoy your meat and potatoes with these recipes. Using the George Foreman Grill for this classic meal ensures that you are eating far less fat than you might with traditionally prepared steak and potatoes that often includes added butter and dairy. The flavor is still there without the extra calories and fat.